This example EA-Matic script keeps the signature of the overriding operations in sync with the signature of the overridden operation. This is especially useful when you are modelling an interface and a number of classes that realize this interface. EA has this neat feature Overrides and Implementations accessed by Ctrl-Shift-O to copy operations from an interface or superclass to the realizing/specializing class. This works great when you have created a new operation, or added a new realizing class, but once you change the signature of your interface operation you are on your own. You need to track down all operations that once overrode your interface operation and change their signature accordingly. Not a pretty task. 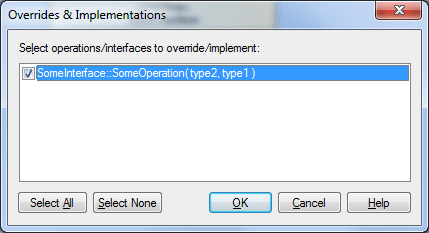 This script ensures that the signature of the overrides is kept in sync with that of the overridden operation. Whenever you change the signature it alerts the user to the fact that there are overrides and asks if they need to be synchronized. 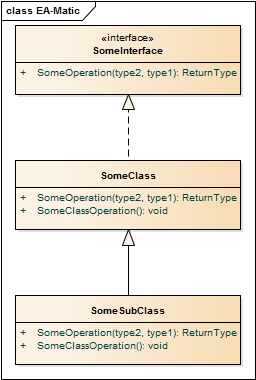 It is then further used to get the operation based on the GUID passed as parameter. 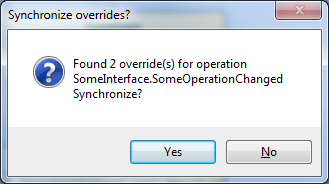 Download the complete script: EA-Matic Sychronize overrides. This script requires EA-Matic version 1.0.12.2 or higher to function. There are two events that we use. EA_OnNotifyContextChanged to react to remember the overrides of the operation before it is changed, and EA_OnContextItemModified to update the overrides one the operation has been changed. 'Event called when an element is changed. Unfortunately EA doesn't call it for an operation, only for the owner so we have to work with that. In OnContextItemChanged we get the overrides by first selecting all operations with the same signature from the model with a query. Then we get all descendants of the owner of the operation (recursively) and filter the operation to only those owned by a descendant. "and (opp.Classifier = opp2.Classifier OR (opp.Classifier is null AND opp2.Classifier is null)) "
'gets all descendant of an element. That is all subclasses and classes that Realize the element. 'Works recursively to get them all. Then when the signature of the operation has been changed we synchronize its signature with that of the with the overrides and we tell EA that the owner of the override has been changed.